Whilst the council was previously spending money on making some roads more accessible for cyclists, elsewhere in the borough they seem to be doing the opposite (although one of them may be temporary). Huntingdon Road (left) has been closed off with a very high kerb. Virtually the same has happened to Bridgeman Road a little further, leaving only Offord Road, to the north, providing access to Caledonian Road. A local cyclist wrote to the councillors for this ward expressing her disappointment that the closure had happened. She received a reply from a councillor stating that he did not want to see cycling on the pavement! If you have used any of these roads and now find your journey disrupted please let your local councillors now. You can find out who they are by entering your postcode here. I went to have a look at this last week and there IS a lot of heavy construction traffic needing to turn into the road so it does seem to make sense temporarily not to encourage cycling into the face of it. To be fair there are roads parallel to Marriot that are just as easy. Please arrange a meeting with the councillor who alleges cycling on pavements in Huntingon St. I walk/cycle there regularly and have never seen it. Indeed it would be difficult and risky to cycle along the tree-planted narrow pavements. The claim lacks credibility. This ‘reason’ for the high kerb in Caledonian sounds like an excuse and am wondering if the councillor above is the same as the one who lives in the street and whether a hidden agenda isn’t in play? 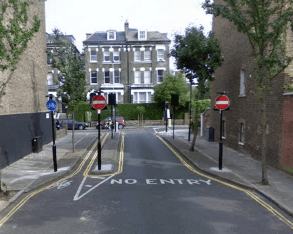 The result of the high kerb is forcing cyclists trying to enter/exit Caledonian Rd via Bridgeman or Huntingdon to dismount – dangerous if you’re Caledonian Rd – or to use either busy Offord Rd/Richmond Ave. The present situation is unacceptable and some transparency required. ‘Please arrange a meeting with the councillor who alleges cycling on pavements in Huntingon St. I walk/cycle there regularly and have never seen it. Indeed it would be difficult and risky to cycle along the tree-planted narrow pavements. The claim lacks credibility. This ‘reason’ for the high kerb in Caledonian sounds like an excuse and am wondering if the councillor above is the same as the one who lives in the street and whether a hidden agenda isn’t in play? The result of the high kerb is forcing cyclists trying to enter/exit Caledonian Rd via Bridgeman or Huntingdon to dismount – dangerous if you’re exiting Caledonian Rd – or to use either busy Offord Rd/Richmond Ave. The present situation is unacceptable and transparency decision to install high kerb required’. The Huddleston road/station road barrier is incomprehensible. It was put up when construction of the student flats was completed, and I use it a lot as a shortcut from Hampstead heath to where I live. How can this happen in an age where cycling needs are supposed to be taken into account by highway engineers? What on earth is going on? 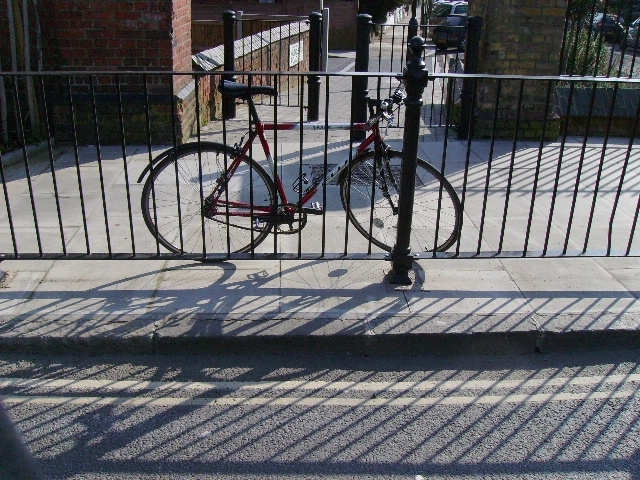 The raised kerbs where Huntingdon Street and Caledonian Road meet were deliberately installed to prevent vehicles and cyclists mounting the pavement (the Caledonian Road east side pavement that is). This was done on a decision made by West Area Committee last year on the specific initiative of Councillors at public request. It has made a significant difference. Bridgeman Rd and Huntingdon Street are no longer through roads and the former roadway has been designated as footpaths. All road users including cyclists are expected to respect this. Cyclists are not “forced” to dismount. 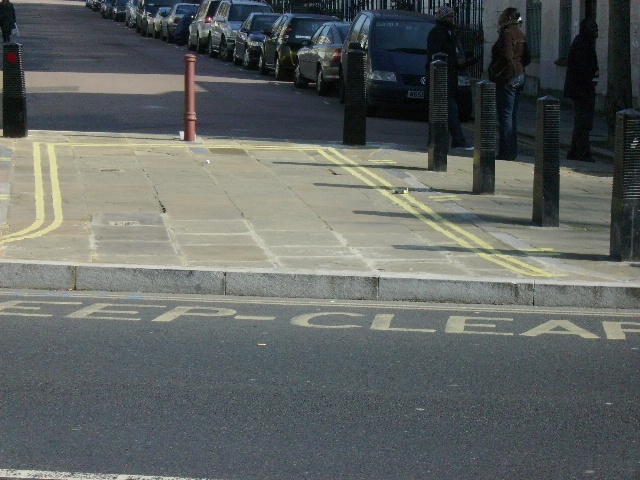 They are expected to dismount and not to cycle across the pavement. In the “hierarchy” of travel modes, pedestrians come first. I am one of the Councillors who supported this scheme. 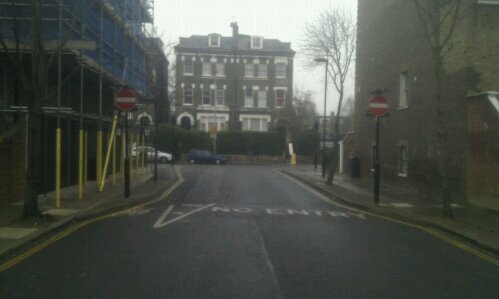 I cycle regularly up Huntingdon Street and Bridgeman Road and I dismount rather than cycle across the pavement. Other cyclists can do the same. You strike me as rather anti-cyclist for a cyclist.